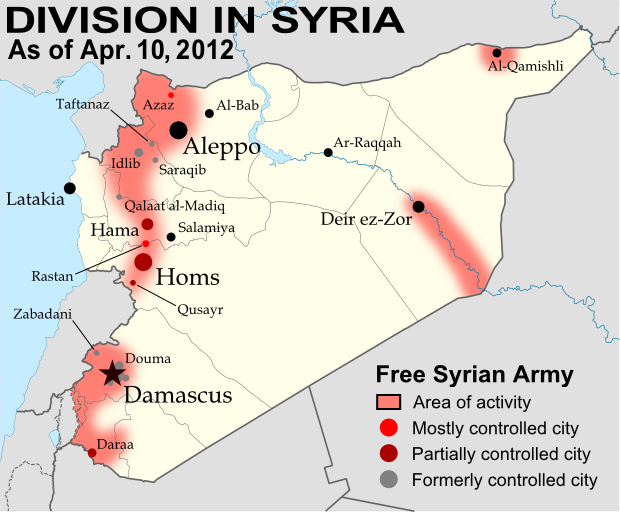 Known areas of armed activity for the rebel "Free Syrian Army", marking controlled cities and notable towns. In the three weeks since our last Syria update, the Syrian military has continued its campaign to retake the northern province of Idlib from the rebel Free Syrian Army (FSA). Having retaken Idlib city earlier in the month, the government forces then targeted the province's second largest city, recapturing Saraqib (Saraqeb) after a four-day battle ending on March 28. In an offensive which is still ongoing despite plans for a U.N.-brokered ceasefire, the Syrian military has also overrun a number of previously rebel-held towns and villages in the Idlib area, most recently taking the town of Taftanaz in an especially bloody battle this week. Meanwhile, a new front has opened up in the north of Aleppo province, where according to some reports the rebels have controlled the city of Azaz and other towns since early March. In central Syria, the battle continues for the city of Homs, of which the FSA still controls some northern areas. The historical site of Qalaat al-Madiq (Madiq Castle) in Hama province also made news at the end of last month, as the Syrian army stormed the town after a two week siege (government-friendly media later reported that the town had been completely captured).